Grass Fed Quark is a HIT! 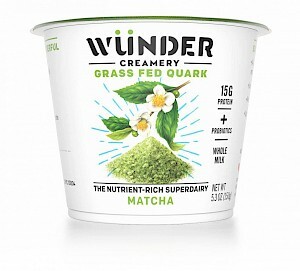 I first tasted quark at the Anuga food trade show in Cologne Germany and always wondered why it never really made it here in the US. A lot of people think its simply because of its name. Get over it. Quark is a creamy unripened cheese that is nothing like yogurt. In fact its nutritional profile is better than greek yogurt. One cup is 160 calories, 6 grams of fat, 45 mg of sodium, 13 grams of carbs, 13 grams of sugars of which 9 are added and a whopping 15 grams of protein. Simple ingredients. A terrific recipe by adding the matcha and green tea extract. Delicious.